a growing anomaly with the ongoing narcissistic selfie trend. 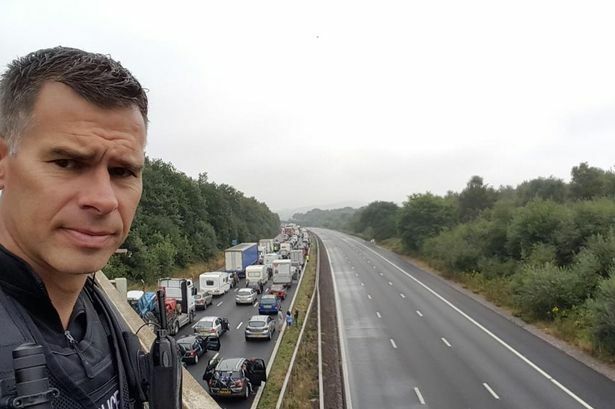 08.25.16: Police officer takes selfie amid M5 tailback explaining 'Sorry guys and girls, someone threatening to jump off bridge'. He has since apologised for the message which was posted on Twitter saying: "Apologies for any offence. None meant"
A traffic police officer posted this selfie after a 'suicidal' woman threatened to jump from an M5 motorway bridge. The woman, 25, negotiated with police officers for hours which caused the massive 19-mile tailbacks for motorist. Eventually she was detained, and that's when Sergeant Harry Tangye decided to take a picture of himself on the bridge. He captioned the photo: "Sorry guys and girls, someone threatening to jump off bridge, but now off and traffic moving." The officer has since apologised for his tweet. He wrote on Twitter: "Apologies for any offence. None meant." The incident left the long weekend getting off to a delayed start for many between Junctions 26 and 27 near Wellington in Somerset. Avon and Somerset Police said the woman was "safe and well" but was arrested on suspicion of causing a public nuisance. The road was shut shortly after 11am this morning Avon and Somerset police said: "The incident is already leading to tailbacks on the motorway in both directions. The roads reopened at about 1pm. Families used the closed carriageway to escape their cars this morning Police later released a statement that read: "We are just re-opening the M5 motorway, both north and south. "It was closed due to concern for the welfare of a woman who is being moved from the bridge. She is safe and well. "We apologise to motorists for the delay and thank you for your patience. "Obviously as backlogs of traffic clear there will be delays and if you plan to travel towards Wellington from the north or south, you may wish to delay your journey." Sgt Harry Tangye, "Sorry guys and girls, someone threatening to jump off bridge, but now off and traffic moving. 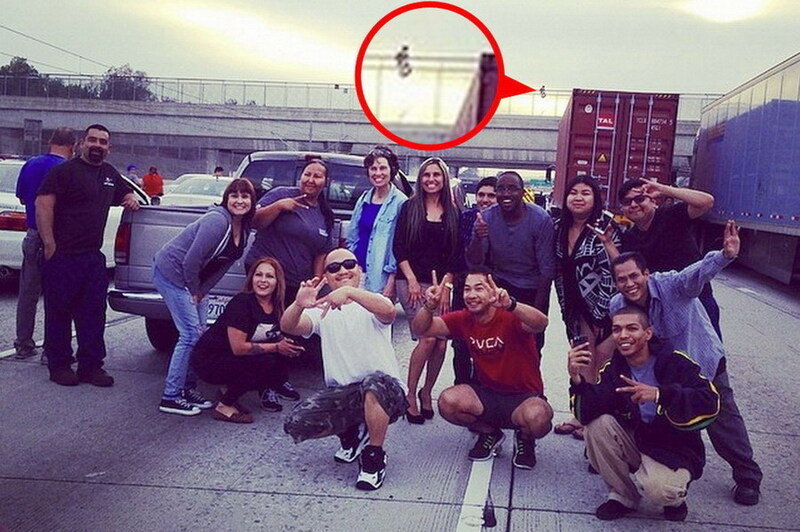 Take time to clear"
04.10.14: suicide selfie: stranded motorists take photo with suicidal man in the background. An LA freeway was shut in both directions for nearly three hours while police talked the man down - leaving heartless motorists to make their own entertainment. 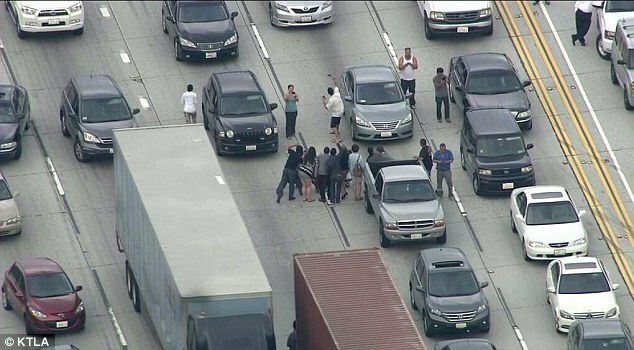 Motorists stranded on a Los Angeles freeway after a man threatened to jump off an overpass took an Oscars-style group selfie as they waited for the road to reopen. The suicidal man was talked down from the bridge by police, but the freeway was closed in both directions for three hours. But a group of 14 motorists found a rather heartless way to while away the time they spent stuck on the road. They posed for a "selfie" photograph - complete with the would-be jumper in the background. Drivers called the police at around 5.30pm on Thursday to tell them a man was threatening to commit suicide by jumping off the overpass above 105 Freeway in Paramount. They closed the road at 6.30pm, but reopened it at 9.30pm after convincing the man not to jump. The ill-advised selfie was originally posted to the account of Instagram user Samdawg1 - who has since made his account private. 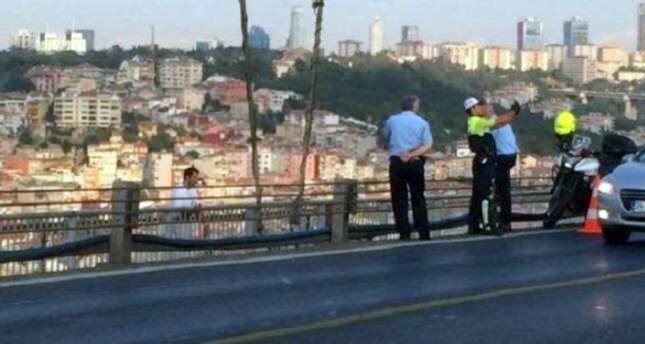 ISTANBUL — A policeman reportedly taking a selfie against the backdrop of a man clinging to the rails of a bridge in Istanbul has raised controversy. Sadrettin Saskin, 35, who reportedly suffered from familial and financial problems, climbed the rails of Istanbul's Bosporus Bridge at around 06:30 a.m. yesterday, determined to jump off. Policemen rushed to the scene, trying to convince the suicidal man not to jump. A photo of negotiations, meanwhile, has hit social media websites. The photo shows a policeman raising his cellphone in an apparent attempt to take a selfie with the man. The authenticity of the photo has not been verified yet but the photo drew the ire of social media users who condemned the policeman's attempt to take a selfie instead of helping the rescue efforts. Local media reported that the Turkish National Police have launched an investigation into the "selfie officer." As for Saskin, the suicidal man jumped off despite three hours of efforts by the police. Divers recovered the man a few kilometers away from the scene. Left unconscious from the fall, Saskin lost his life despite resuscitation efforts. Officials said Saskin had attempted suicide twice before. The suicide on the bridge, one of the busiest transit routes connecting Istanbul's Asian and European sides, led to a frustrating traffic snarl that continued for hours. 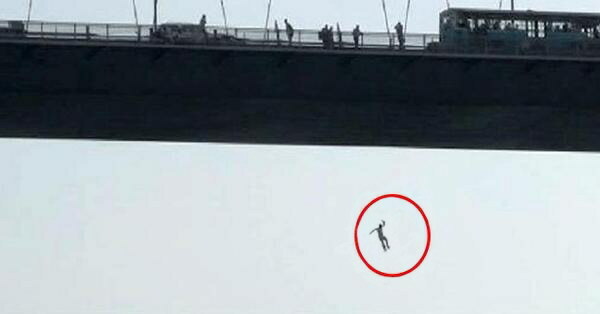 The Bosporus Bridge is often the scene of suicide attempts. On Aug. 21 at around the same time in the morning, another man jumped to his death from the bridge. 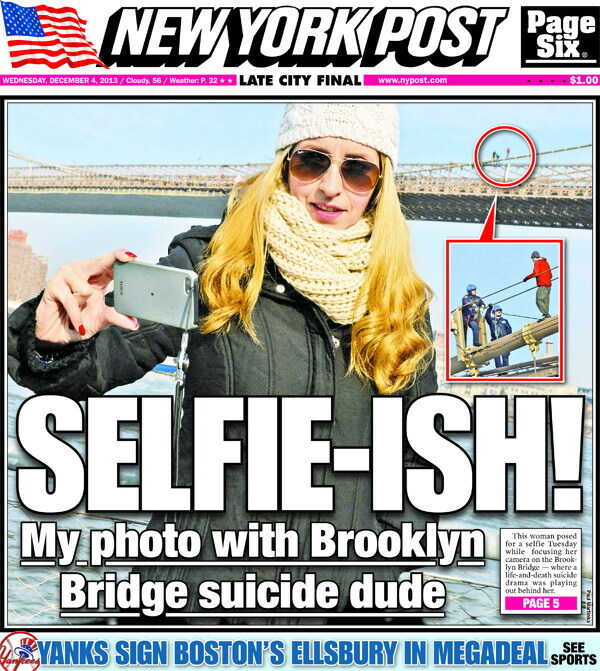 12.03.13: woman takes selfie with suicidal brooklyn bridge jumper in the background. 12.03.13, nydailynews.com, Police talk man out of jumping from Brooklyn Bridge. By Paul Martinka, Don’t jump — until I get this picture lined up! 12.04.13, dailymail.co.uk, A witness to the woman's heartless selfie says she knew exactly what was going on in the background at the time, Suicidal man climbed on the bridged and threatened to jump, A group of onlookers, including the woman, watched for 25 minutes as police attempted to rescue bridge jumper. Is this the most tasteless selfie ever? A tourist in New York City snapped a picture of herself in front of the famous Brooklyn Bridge as police tried to talk down a suicidal man who was threatening to jump Tuesday afternoon. A witness who watched the woman's heartless moment says she knew exactly what was going on behind her. The tourist had been watching the drama unfold for up to 25 minutes before she pulled out her phone and took the shot. Police eventually saved the man's life - talking him down from the bridge. 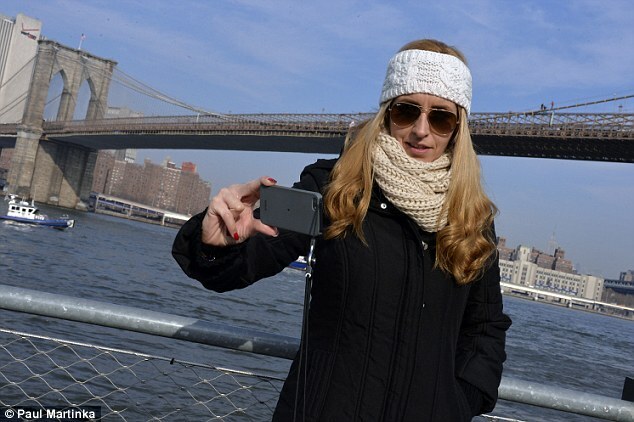 The woman, who had long blonde locks and was wearing a matching scarf and headband, held out her camera phone and appeared to make sure that she captured the bridge jumper in the background of her shot. During that time, police boats roared through the water and a police helicopter buzzed overhead as officers inched out toward the desperate man. The eyewitness said: ‘There was a group of about 30 people who were down by the water watching what was going on. 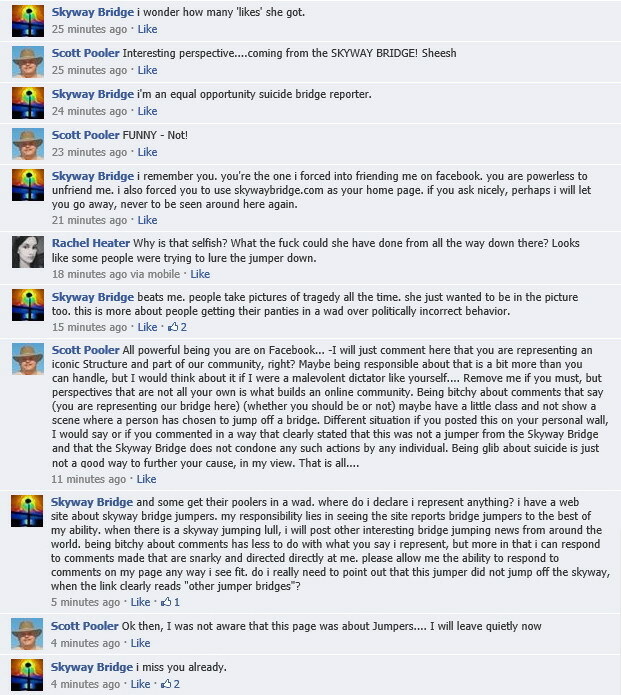 ‘The jumper was up there for about 25 minutes and they were watching what was going on on the bridge. ‘Everyone knew what was going on, there were boats, helicopters. When a reporter for the New York Post asked the woman for her name, she suddenly became camera shy and refused to talk. By taking a photo of herself in front of a suicidal figure on the Brooklyn bridge she has become a scapegoat for our worst fears about the modern age. It's the most selfish "selfie" ever! While police officers tried to talk down a man who was preparing to jump off the Brooklyn Bridge, a woman in the park below took out her phone and posed for the type of photograph that recently gave the Oxford English Dictionary its word of the year. She made the cover of the New York Post, which apparently had a reporter or stringer or citizen journalist or busybody in the park at the time. "Selfie-ish!" declares its headline, over a picture of the woman taking her outrageous picture. Wrapped up against the cold and in sunglasses, she wields the phone with a certain practised lightness that suggests an affectless, unengaged and deeply ephemeral exercise – as if she's taking her portrait literally without thought, let alone any feelings one way or the other about the human crisis in the background. Our culture has plainly got something wrong with it. The selfie craze has got out of hand. It started as a bit of fun but now turns out to be a descent into heartless self-obsession and inane photophilia that turns a perfectly normal-looking individual into a cold Warholian observer of death and disaster, whose only reaction to another's pain is to take a picture of herself in front of the scene she chanced on. And is that a smile she's cracking? And got on to the front of a New York tabloid. Here is the strange twist in this tale of cameras and ethical depravity. The picture that has made the news is not the selfie, but the shot of the selfie being taken: and it's such a crisp, well set-up image, you might almost wonder if the whole thing was a set-up. I am sure it is a genuine record of contemporary mores. However, the choice to make this a story says something in itself about our time. Is the Post's amazement and disgust and the internet's agreement that this is "the worst selfie ever" a simple reaction to a misguided snapshot? It's more than that – for here is the proof of the emotionless, shallow nature of this solipsistic cameraphone craze that everyone was waiting for. The selfie had it coming. Both descriptions are arguably true. Life in the 21st century is inherently ambiguous: not for nothing is Heisenberg a popular name for babies (yeah, Heisenberg was a physicist fascinated by uncertainty before a chemistry teacher turned drugs supplier took the name in the TV programme Breaking Bad). So many contemporary phenomena into which millions throw themselves can be seen as on the one hand modern, democratic, liberating instruments of progress and yet on the other hand, with equal validity, as time-eating cybermats of the apocalypse. People like the hapless Brooklyn bridge selfie-taker are unlucky enough to be made scapegoats for our deep, perhaps irresolvable confusions about the way we live now. Are we heading for a golden age of instant communication or a digital wasteland? Most of the time we embrace the future with glee, heading for the shops this Christmas to get more gadgets that will create more cultural tropes. But there's this nagging doubt that maybe we're all turning into Andy Warhol's sterile clones. The world's worst selfie is ammunition for everybody's worst fears about the modern age. 12.05.13, we had an amusing facebook skirmish with a guy in a hat about this incident.